Air New Zealand is showing flights from Calgary to Sydney, Australia or Auckland, New Zealand for $928 to $991 CAD roundtrip including taxes. This is about 40% below the typical best roundtrip prices from Calgary to either country. It's pretty common for these flights to bottom out in the $1600s roundtrip. So if you've been waiting for a flight to either country, today would be a very good day to strike. Flights in the low $1000s between February 2017 and May 2017. Try Tue to Wed and Wed to Wed dates in Jan/Feb/Mar/Apr/May 2017. Update: August and September seem to be the only months still showing flights in the $900s. November has some in the low $1000s. Try the same dates from the Sydney list above. There are flights for as low as $936 CAD roundtrip, which is nearly half the typical bottom roundtrip price. Flights to the Gold Coast are usually a lot more expensive than to other places in Australia. Try Wed to Tue and Wed to Wed dates in Jan/Feb/Mar/Apr/May 2017. 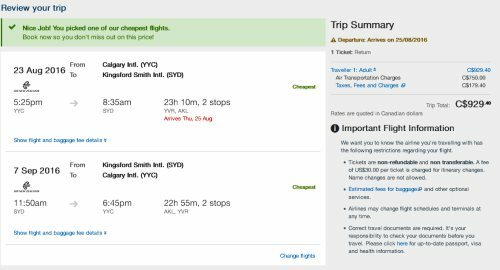 Update 7/28 - Flights in the $900s roundtrip from Calgary to a variety of cities in Australia and New Zealand are back again today. They are available for travel throughout 2016 and 2017. Scroll up to the beginning of this blog post, and try starting with dates from the lists above, but instead of searching on Expedia, you may want to try searching on Momondo. Update 8/3 - The January, February, and March 2017 dates have been the more difficult dates to find cheap prices for. 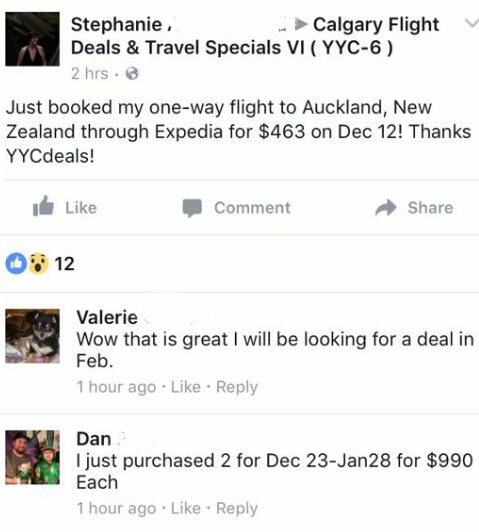 Below, I have listed the 2017 dates from Calgary to Australia and New Zealand that are still in the $900s CAD roundtrip including taxes. For longer trips, you can also try mixing and matching the departure and return dates from the lists below. When you get to Momondo, you may want to look for the option to click through to FlightHub for booking. Sometimes you may need to scroll down a bit. There are a few other sites showing prices in the $900s on Momondo, but some of them are pretty low quality booking sites. calgary, yyc, flight deals, sydney, australia, syd, auckland, new zealand, akl, air new zealand, pacific islands, rarotonga, cook islands, australasia, polynesia, oceania, rar, melbourne, mel, brisbane, bne, gold coast and ool. 9 Responses to "Calgary to Sydney, Australia or Auckland, New Zealand - $928 to $991 CAD roundtrip including taxes"
Do these deals typically disappear so quickly? I just tried and it isn't working. Does the deal only last for one day? Update: August and September seem to be the only months still showing flights in the $900s. November has some in the low $1000s. 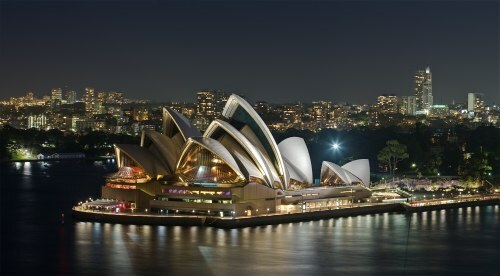 I've posted some examples under Sydney. This was posted on July 12th. It's gone. We took advantage right away (last week) and were able to book our family of 7 on flights next April at just over $1000 each! Thank you for sharing and saving us literally thousands of dollars on flights! That's awesome Holly! It can't be easy to get a family of 7 to Australia! Regarding the 7/28 update: I don't see the Rarotonga prices. The best I can find even using Momondo is $1067 CAD (200 more than this posting says).